Today: How to make your muffins puff up with pride. In a line-up of muffins -- some homemade, some bakery-made, and some factory-made and vacuum-sealed in plastic bags -- it's not difficult to identify the usual suspects. Bakery muffins have gently mounded tops -- chests puffed proudly, extending beyond the boundaries of their liners, not to be withheld by the confines that humbler muffins abide by. Homemade muffins are a flatter, shyer species. 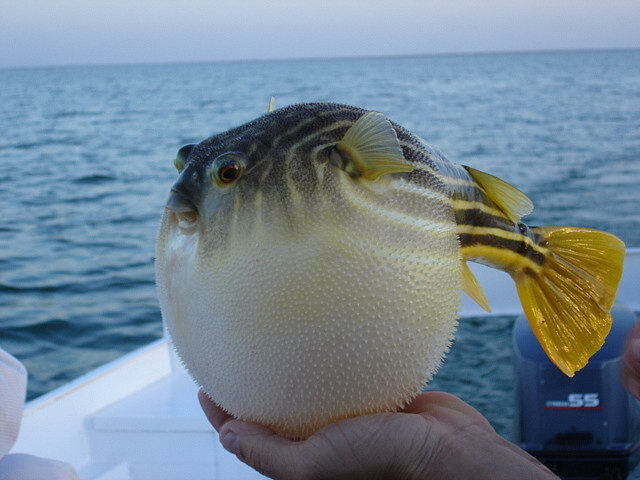 They're smaller and more compact and, because they don't live in fear of having their overflowing tops snatched, they're also less intimidating. Factory-produced muffins are something else entirely. 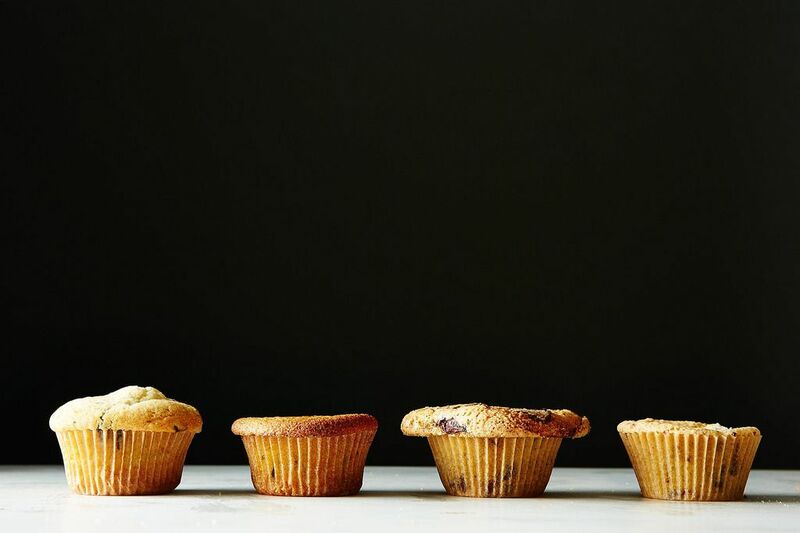 But some of us eat muffins only for the muffin top, and so we have to ask: How can we make tall, rotund bakery-style muffins at home? To answer this question, we turned to expert baker Zoe Nathan, whose book Huckleberry has us pointing at every picture and nodding at every recipe, mouths agape. Zoe was skeptical. In compiling and testing the muffin recipes for her book, she found that recipes that yielded beautiful domes in Huckleberry Café's industrial convection ovens did not give the same results in home kitchens. Without an industrial convection oven, most muffins fall flat. Adding more flour. Zoe was confident that amping up the amount of flour in a standard muffin recipe would give home cooks domed muffins, but she warned that it might result in floury, dense muffins. The original recipe calls for 1 1/4 cups of all-purpose flour, so we upped the amount to 1 2/3 cups. Starting the muffins at a higher temperature for 5 to 8 minutes. Here, we applied the theory that a very hot initial oven temperature would cause the butter in the batter to release steam at a faster rate, thereby giving our muffins an early boost. We started them at 400° F, then lowered the temperature back to the standard 350° F after 5 minutes. While Zoe is a firm believer in baking at high temperatures, she was worried that this experiment might overcook the outsides and dry out the insides of the muffins. Using the convection setting on the standard oven in our test kitchen. The convection setting of the oven uses a fan to encourage even heat circulation. The thinking behind using a convection oven to create domes is simlar to the idea of starting the muffins at a high temperature: steam the butter early on. This technique that can make other baked goods loftier, too: Zoe told us that liquidy batters, like pumpkin bread, will "jump" in a convection oven, where they cook faster. Convection bake also does a better job to ensure that the insides and outsides of the muffins cook at an even rate, which means that the middle of the muffin should bake (and rise) along with the edges. To compensate for the more powerful baking on the convection setting, we lowered the temperature from the recommended 350° F to 325° F.
And here we go: The big reveal! Zoe was right (no surprise there): The muffin with the extra flour was the only one that rounded. It was definitely the cakiest of the bunch -- more floury than buttery, with a crumbier, dryer texture -- and tasted more like a purchased muffin than any of the others. You can see that the high-temperature muffin developed a much deeper color. Its crunch was only surface deep -- it maintained a soft, buttery middle that a butter knife glided through easily. The muffin we baked using the convection setting expanded outwards rather than upwards, stretching over the sides of the tin and encroaching into the space of its neighbors. (Below, we placed our four different batches of muffins in one tin for comparison's sake.) It was crunchier and firmer than any of its cousins. 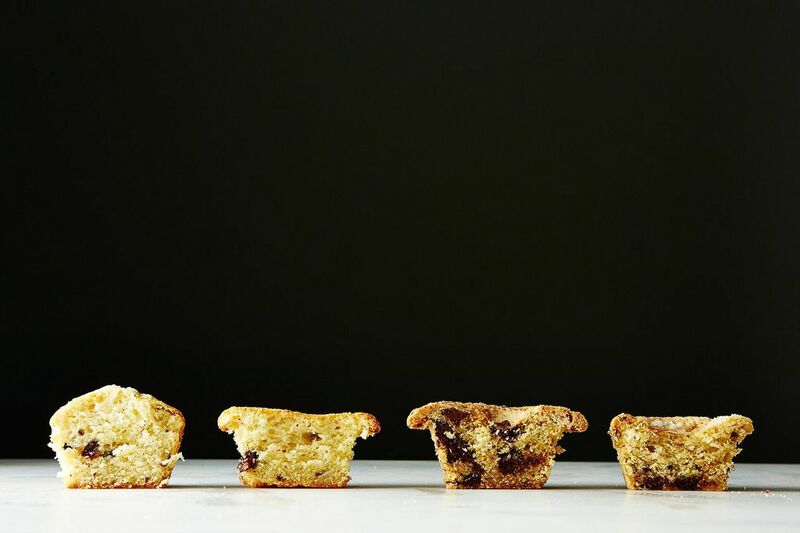 The original muffin was a staff favorite: light and buttery with just the right moisture level. Sure, it sank a little in the middle, but no one complained about it. Zoe herself doesn't understand the craze surrounding domed muffins and cupcakes. For cupcakes especially, Zoe believes that a dome would distrurb the ratio of frosting to cake and thus disturb the universe, as well. Make sure you're using fresh leaveners. Throw out baking soda and baking powder that's ineffective and long-expired. Use a folding motion, rather than a mixing motion, to combine the wet and dry ingredients -- you want your batter to be as light as possible. Do not open the oven until the cupcakes are nearly done, as you'll risk lowering the temperature and introducing an airy breeze. Go with a light and airy recipe. 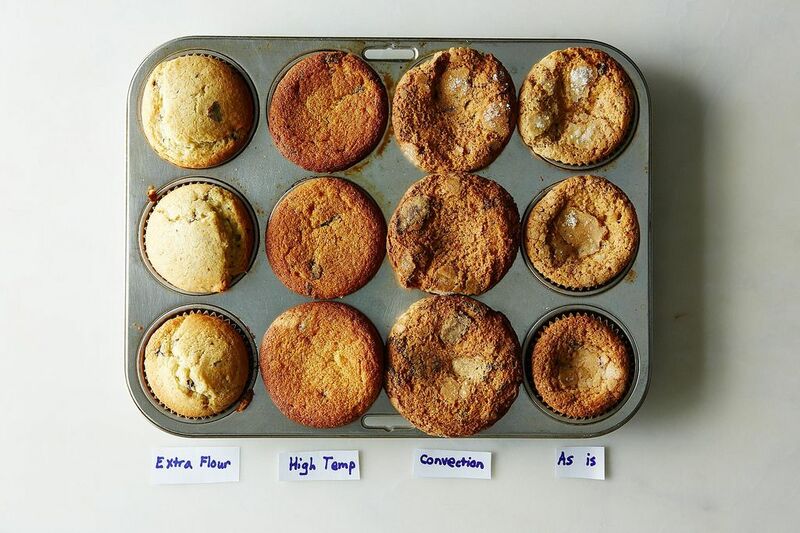 Some have found that dense muffins loaded with heavy add-ins are less likely to dome. If you have strong opinions on domed muffins and cupcakes (or reliable tips for achieving them), we want to know. Share your thoughts in the comments below! Do you know how long and how many times I have experimented with muffins to achieved the domed top? Too long! You have a fan for life! My blueberry muffins came out perfect with the extra flour. Thank you so much! I use a "muffin-top" type pan. All dome. Interesting!! I use my mother-in-laws recipe and have never had issues with flat tops unless I under fill the tins. They are also baked in a 400F oven and the recipe calls for oil, not butter. They've been cooked in a gas oven, electric oven, toaster oven, and convection oven with a gorgeous domed top virtually every time. I'd really like to see this test performed on a more standard muffin. As I just mentioned in another comment on this thread, the 2 1/2 cups (!) of chocolate make this a really unusual muffin. The ratios are perplexing. As you know, the balance of the primary components of a quick bread or muffin recipe -- flour, fat, eggs, liquid -- determine its success. End of story. Separate egg yolks and egg whites before combining with other ingredients and whisk the whites until stiff. Then follow your muffin recipe as normal and fold in the egg whites into the batter as a final step before baking. Lightly mix the ingredients and let the muffins rest in the muffin pan for about ten minutes before baking. I'm a Food Industries Engineer and work with Bakery Applications daily. The basis for a good dome will be the proper generation and liberation of the CO2 at the right time. This is caused either by baking powder or yeast. You can just add a little bit more (30% more at least) of what the usual formula or recipe says and I can guarantee you that it will rise and you'll have a domed muffin. You don't have to have an industrial oven since I've made domed muffins at work (with industrial oven) and at home (with common oven). If anyone needs recipes or advise, feel free to ask. Great to know! If you end up making the Chocolate Chunk Muffins with increased leavener, please let me know what you find (and take a picture!). I find that by filling up the liners all the way to the top, it creates a beautiful big dome for the muffins. But whether this works really depends on the recipe, and thicker batters are less likely to spread and form a mushroom-like top. I love crunchy muffin tops! All I do is preheat the oven to 500 degrees F, then as soon as I put the muffins in the oven bring the temperature back down to what the recipe asks for. Works every time! I do have some experience which might help with this. One of my first jobs was baking muffins at the Morning Glory Cafe on Nantucket. Keeping the batter lumpy, only lightly folding in the dry ingredients add structure and height to the muffins. I make a lot of muffins and blame my crappy gas oven on non-rounded domes - but maybe others have the same problem. I generally add a little more flour and a little more leavening agents (lightly mounded cups and spoons, as opposed to brushed flat) to get them to rise. Some recipes are better than others for round tops, I find a thicker batter with around 2 cups flour and 1 cup of dairy give me the best results. I don't typically have non-dome issues but tend to stick to certain recipes. I've heard extra eggs cause muffin tops to sink, and I see this one has 2 eggs. I wonder what leaving one out would do? One of my favorite base muffin recipes- Heidi Swanson's millet- uses 1 egg to 1 1/8 c flour ratio. Just a thought! Not sure if that'd mess up other chemistry. Always more to learn. If you make it with one egg, please let us know it goes! In the oven now...how long, Sarah, like 20 min? Pesky recipe entry system! It's in there now! So glad to see this Sarah! I bought Huckleberry a few months ago and tried about six recipes in a week. The first muffins I made were the apple cinnamon crumble muffins, and yes, they did sink a bit in the middle, but the crumb was so light and perfect. However, after making the fig-brown sugar muffins, my first thought was that they needed more flour, not only because they sank in the middle, but because they were greasy (especially on the bottom). I made a note to myself to add more flour next time. I had the same experience with the chocolate banana walnut cake -- it was spongy in texture. I compared it to similar recipes from Dorie, etc., and it uses 2 cups of flour versus the typical 2.5 to 3 cups. I appreciate her note in the foreword about why she didn't add more flour to get the muffin tops that we all expect. 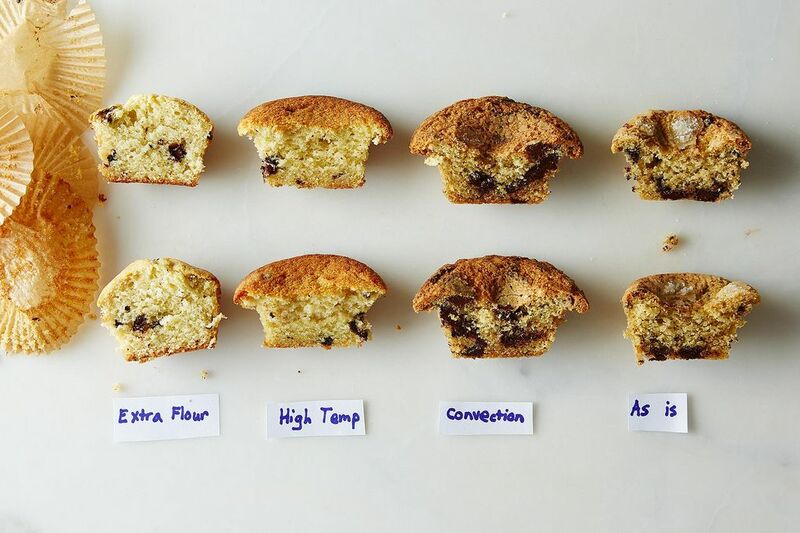 I think this approach works ok in some of the muffin recipes (the ones you tested, the apple-cinnamon crumble muffins) but not as well in others based on fat content and other variables. Ah, the challenges of writing a baking book! it continues to amaze me how much ovens vary in power! I am so impressed that you tried 6 recipes in 1 week. That is a feat in itself. Muffins should be domed!! And the high temperature actually causes the exterior to set before the butter and moisture inside has had enough time to generate steam since heat conducts at the same speed within the batter regardless of how hot the oven is. Since the exterior and top is already hardened, the steam won't be strong enough to "raise the roof". So smart! 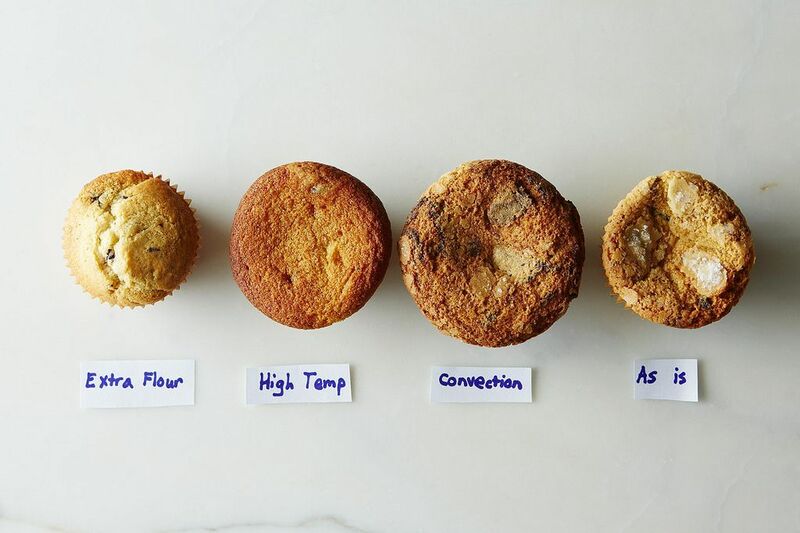 That explains our high-temp muffin: soft and dense in the middle, expanded more out than up, crisp outer shell. Thank you for that information! I am excited for this comment thread to become a place where people can share domed muffin advice. No problem! Loved the post by the way! Excellent research, Sarah. And I think you know that I could talk about this subject for days. I feel strongly that a muffin should be domed. And a cupcake should be flat-ish (it's just a vehicle for the frosting, anyway, right?) If you haven't read Shirley Corriher's BakeWise, you should. She's like a crazy-smart scientist/baking genius, and you will learn the ways of how to properly use rising agents, which I'm convinced is the answer to muffin/cupcake success. I have an electric Kenmore oven. I hate my convection setting, though, and never use it. Something about cheaper appliance brands - they just don't do convection right - seems like the fan always pulls the heat in weird direction. I have a "Cake" selection on my oven, which I use for everything. I think it cycles the upper and lower heating elements more frequently, creating a more even heat throughout the oven. I think it's a good day to try out this recipe!